Welcome to your Condo Insurance Guide for Edmonton. This page will give you an idea of Condo Insurance Premiums in Edmonton, will explain details of condo insurance and make it possible to get a free condo insurance quote. Interestingly, 61% of Canadian condo owners don’t know / don’t understand that a flood or fire in their condominium unit is not covered by the building’s insurance (also called commercial condo insurance policy) as Edmonton Sun wrote a while ago. You need to have your own personal condo insurance policy to stay protected. What Are Typical Rates for Condo Insurance Edmonton? Are you looking for a condo insurance in Edmonton or interested to see if you are overpaying for your existing policy? Get a free condo insurance quote and start saving today. A following overview shows you what a typical condo insurance policy covers. Find out an explanation for each item further below. Normally there are two policies involved into insurance aspects of a condo. Our detailed article explains what the commercial condo policy covers, versus your personal condo insurance policy. Understanding what your personal condo policy is crucial to avoid unexpected out-of-pocket payments – see more details below. 1Upgrades: Upgrades or improvements include hardwood floors, new cabinets or counter tops, crown moulding, and wallcoverings. Some condo corporations have passed bylaws making unit owners responsible for all flooring materials and countertops in their units, regardless of whether or not they were upgrades or improvement. Coverage limits for upgrades usually start at $2,500. 2Contents: Any of your personal or specialty property inside your unit must be insured under your personal condo policy. This includes furniture, electronics, household goods, clothing, etc. Most policies will protect your contents against water damage, as well as other types of loss. With most policies, you can choose a limit that starts at $20,000 and goes as high as you need. 3Third party liability: Should you, for example, forget to turn off the kitchen faucet and it causes water damage to unit owners beneath you, they can sue you for damages. 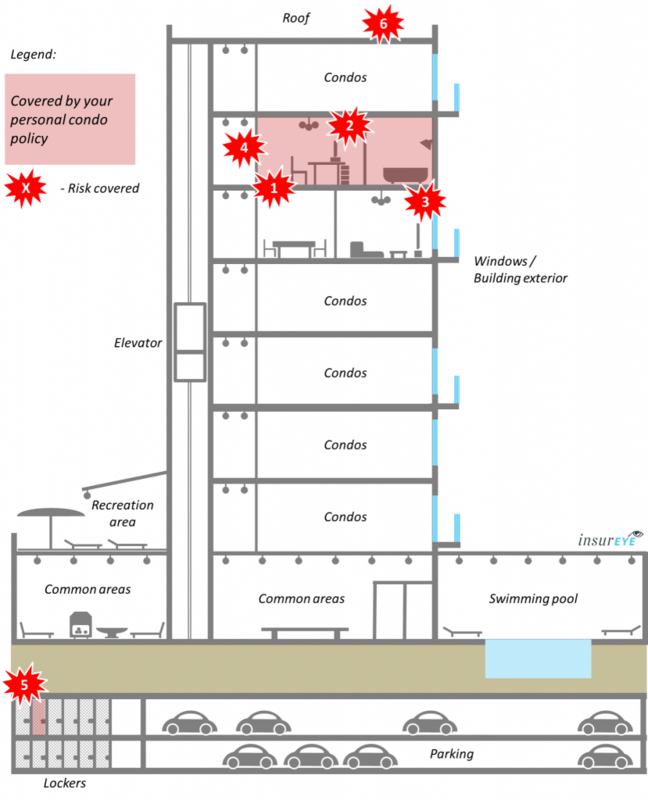 This coverage also protects you if somebody gets injured while in your premises (e.g. slipping on a wet floor). Condo insurance would include this type of liability protection. Typical amount of coverage ranges between $500,000 and $3,000,000. 4Theft: Should any of your property be lost due to theft, most Condo Insurance policies would cover it. Overall, risk of theft is not that high in condos because of condo security services such, for example, security staff on premises, fobs required to access elevators and common areas. 5Your locker: Did you know that from an insurance perspective, your private locker is considered to be part of your insured premises? So, if something is stolen from it, you can rest assured that your personal condo policy will protect you. 6Special insurance assessments: There are a number of situations where commercial condo policies do not cover all damage. In these cases, the condo corporation can make assessments against individual unit owners. This most commonly occurs when a unit owner is responsible for the damage or if the loss originates from a single unit. Condo corporations can also make assessments against unit owners if there is a shortfall in the commercial condo policy. These assessments can total $25,000 or more. As a unit owner, you can protect yourself against insurance-related assessment by having the right personal condo policy. And the bonus one – Additional living expenses: What would you do if you couldn’t live in your unit because it suffered damage and is undergoing insured repairs? If you don’t have friends or family members to stay with, you could be out of pocket thousands of dollars for temporary accommodations. Your personal condo policy includes protection for additional living expenses, which includes the cost of temporary accommodation. Limits of coverage usually start at $10,000. Need a condo insurance or want to understand if you are overpaying for your existing condo insurance in Edmonton? Get a free condo insurance quote from our partner, Square One Insurance, specializing in Home and Condo Insurance and start saving today. The biggest trend currently observed in Alberta and Edmonton is that the condo corporations / builders move more responsibility to individual unit owners. For example, unit owners might be responsible for damages to any original counter and flooring materials in the home. Typically, that would be covered under the condo corporation’s insurance. Unfortunately, this means individual unit owners need to buy and pay for more coverage than before. Thus it is critical you have the right protection or you could be stuck with a large bill for under-insured damages.